Atuveciclib Racemate is the racemate mixture of BAY-1143572. 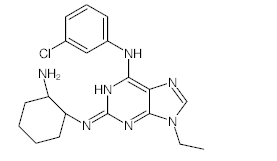 BAY-1143572 is a potent and highly selective, oral P-TEFb/CDK9 inhibitor which supresses CDK9/CycT1 with an IC50 of 13 nM. CDK4-IN-1 is a selective inhibitor of cyclin-dependent kinase 4. Riviciclib is a flavone and cyclin dependent kinase (CDK) inhibitor with potential antineoplastic activity. Riviciclib selectively binds to and inhibits Cdk4/cyclin D1, Cdk1/cyclin B and Cdk9/cyclin T1, serine/threonine kinases that play key roles in the regulation of the cell cycle and cellular proliferation. 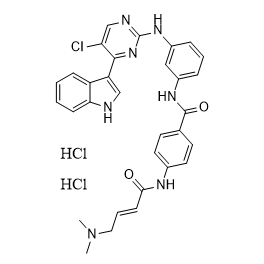 Roscovitine is a potent and selective CDKs inhibitor with IC50s of 0.2 μM, 0.65 μM, and 0.7 μM for CDK5, Cdc2, and CDK2, respectively. 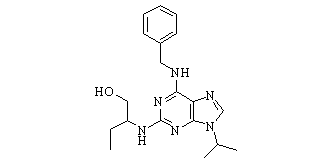 CGP74514A is a CDK1 inhibitor with potential anticancer activity.